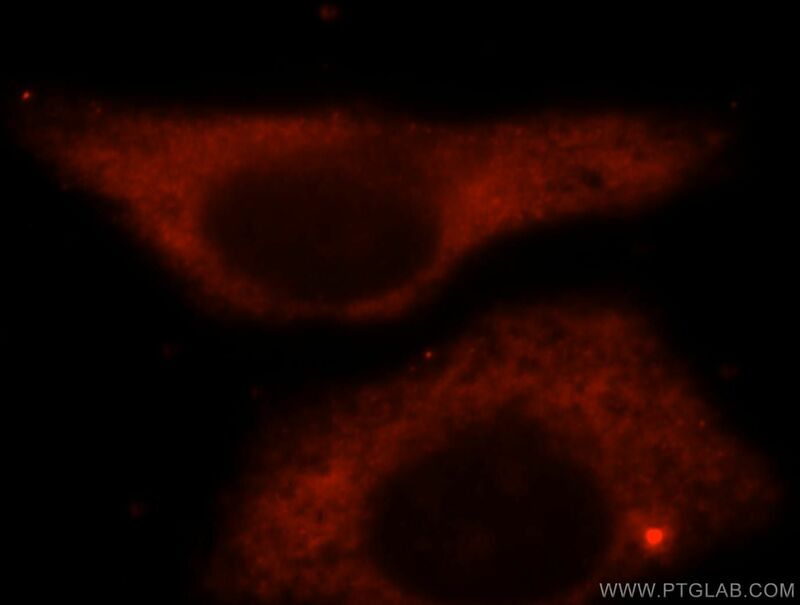 Immunofluorescent analysis of HepG2 cells, using BAG1 antibody 16148-1-AP at 1:25 dilution and Rhodamine-labeled goat anti-rabbit IgG (red). BAG1 have been identified that modulate gene transcription through poorly defined mechanisms. Four isoforms of the BAG1 protein (BAG1S, BAG1, BAG1M and BAG1L) can be produced from a common mRNA by use of alternative translation initiation sites, including a non-canonical CTG codon in one instance. The longest, BAG1L (Mr ~50K), contains a nuclear localization signal (NLS) and resides in the nucleus, whereas BAG1M (Mr ~46K) has an incomplete NLS and distributes mainly in cytosol, unless dragged into the nucleus through interactions with other. Distribution of BAG1S(p33) is not clear yet. This antibody can recognize BAG1L and BAG1V.